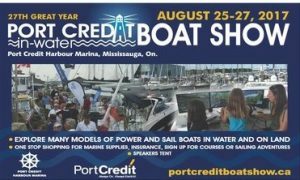 For the 27th year, the Port Credit In-Water Boat Show will close the summer season, with what show organizers are promising the biggest and best show yet’. Held at the Port Credit Harbour Marina – August 25-27 – the PCIWBS will showcase a fine array of boats from marina residents including – Pat Sturgeon Yacht Sales, Anchor Yachts and Navy Point Yacht Sales. Four Muskoka based marinas operating under the Parkbridge Marinas banner will be on hand as will CAS Marine Sales from Cambridge. The North South Yacht Sales Team will anchor R dock, as always, with a selection of used vessels for boat buyers to view. Leading the marine services section of the show are PCHM residents Fogh Boat Supplies and Bristol Marine. Other exhibitors under the grand tent include Skippers’ Plan Boat Insurance, Adventure Sailing Plus, Spike-on-the-Water – a mobile boat cleaning service, and a couple of local yacht clubs – just to name a few of the great exhibitors committed to this year’s show. The PCIWBS speaker series has always been a great show stopper. Craig Hamilton of Boaterskills.ca will appear Saturday at 1PM with a seminar on boat handling and boating safety. Aubrey Millard continues the boating story of Living the Dream, each morning at 10AM. On Friday Aubrey will cover boating travels from the Great Lakes to Northern Europe while Saturday’s travelogue will cover the Eastern Seaboard from Newfoundland to the Yucatan. The talks wrap-up Sunday morning with the final episode North to Alaska. The Canadian Power & Sail Squadron returns to the show this year with their Boating Skills Virtual Training Simulator. It’s risk free boating where participants navigate their way through over 12 different boating challenges! 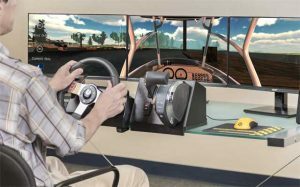 Be sure to test your skills. Are you eco-curious? Then stop by the Georgian Harbour Yacht Sales slip to see the first truly hybrid production yacht – the GREENLINE 33. In a recent interview, GHYS president Gerry Zidner, president of GHYS stated that the Greenline 33 is probably the most innovative production yacht in the world. ‘With 1,800 watts of solar panels on the roof that charge the 11.5K lithium-polymer battery, the GREENLINE can cruise at low speeds for up to 20 NM (23 miles) without ever running an engine’ stated Zidner. And that’s just a few of the great things to expect at this year’s show. Don’t miss the fun. Take advantage of the end of summer boat sales – and find out why life is better with a boat! General Admission: $10 | Seniors: $5 | Children under 15 free. Weekend passes available. How to Get to the Port Credit Harbour Marina.